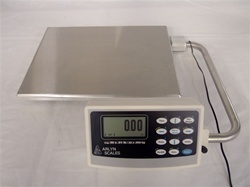 Many industries have use for industrial bench scales. These scales are designed to be more sturdy than smaller scales, because they are designed to hold more weight. These scales vary in features, depending on which type of industry they may be designed for. For normal household use, scales do not have to be as sturdy. The normal kitchen scale does not have to withstand a lot of excessive wear and tear. However, the normal kitchen or bathroom scale is not designed to hold much weight. Because of their light weight, the objects that are places on a normal kitchen or bathroom scale will probably not cause much damage to the scale. However, this does become more of a problem to consider in industries, such as manufacturing, technology, and agriculture. In these types of industries, larger and heavier objects are probably being placed on the scales. These larger and heavier objects can definitely cause more wear and tear for an industrial scale. Therefore, industrial bench scales are designed to be stronger — to stand up against the size and weight of the items that are placed on the platform to be weighed. They are also designed to be much more accurate, as this is generally a requirement in industrial environments. Objects with a larger size and heavier weight can pose more of a problem than simply causing wear and tear to the scales. These larger and heavier objects may actually be harder to weigh precisely. Because of this fact, industrial bench scales are designed with these types of objects in mind. Larger and heavier items are placed on the platform and weighed electronically. With the industrial process that is used, you can rest assured that the objects that are placed on the scale are weighed with accuracy and precision, no matter how large or heavy they may be, up to one hundred pounds. Users from different fields and different industries have varying needs for an industrial bench scale. In some industries a standard industrial level of accuracy might be good enough. For these situations, a simple industrial bench scale, without many features may be sufficient. In other situations and industries, accuracy and precision may play a much greater part. For those situations, there are industrial bench scales that provide many more features. For example, Arlyn Scales Ultra Precision bench scales are more then ten times as accurate as regular bench scales. Yes, these features may cause slight increases in costs for the industrial bench scale. So, industries that do not need these features will probably choose the scales without those features. However, for the industries that do need these extra features, they are available. A wide variety of features ensures that users from every industry can find the industrial bench scale that fits their needs. People from many industries have needs for industrial bench scales. These scales are able to weigh much larger and much heavier objects than standard scales. However, the size and weight of those objects could actually damage the scale, if it were not for the special design of the scale. These various features are what make industrial bench scales suitable for many different industries. To find the industrial bench scale that may be most suiting for you, do not hesitate to visit www.arlynscales.com. We’re sure to have precisely what you’re looking for today!